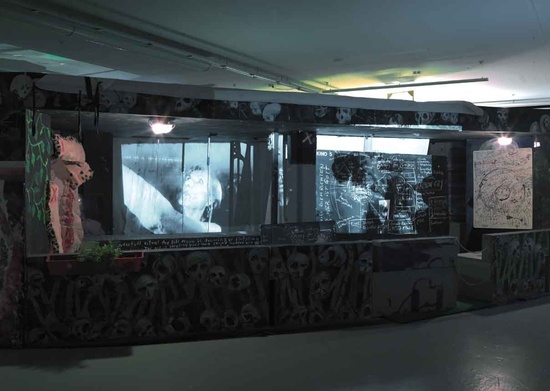 Taking as his starting point the American artist Allan Kaprow’s 18 Happenings in 6 Parts (1959), Schlingensief conceived a walk-through installation, which appears at the beginning of this exhibition. Where Kaprow’s central concern was to convey the theatrical elements of visual art, with the idea of liberating them from their painterly-contemplative stagnation, both – he and Schlingensief – achive this not through the implementation of artificial, artistic activities but rather through simple gestures like the squeezing of an orange. Addad to this, spacial separation makes it impossible for the spectator to see all the happenings simultaneously, which calls into question the fragmentary nature of vision; this is achived in Kaprow City through the division of spectators into different groups and the execution of everyday acts, sometimes by people handicapped in some way or another.